If you’ve been testing or even running Exchange 2010 in production, you will most certainly be aware of the Exchange Control Panel – which is now not only the user’s Options panel but provides access to a number of Administrative tools, such as basic user management and reporting/mailbox searches. 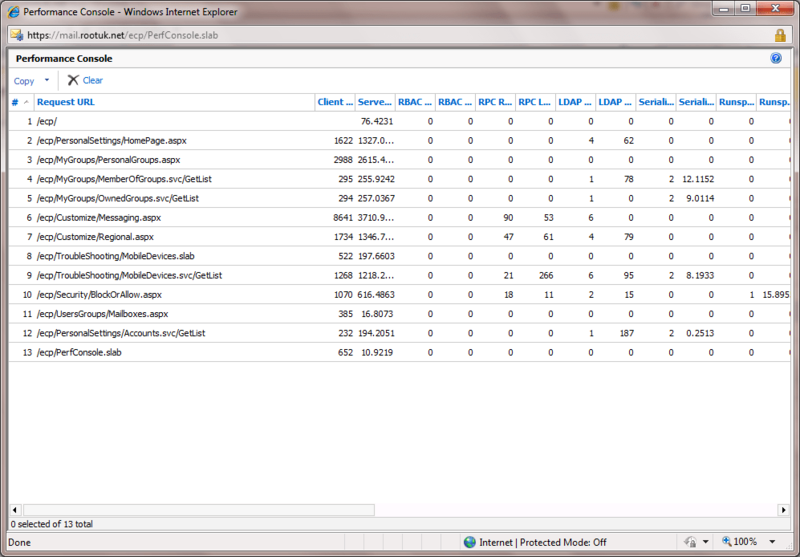 However one feature contained in the ECP but isn’t visible immediately is the ECP Performance Console. The ECP Performance Console is ECP-specific in that it provides a whole wealth of information about how your Exchange Control Panel is performing – from how long client requests are taking, RPC latency down to what’s happening on the Powershell side. Although it is totally ECP specific the information can help you diagnose areas in which your client access server isn’t performing as it should and verifying improvements are working as they should. Change the value for ShowPerformanceConsole to false to true as described in the preceding comment, and save the file. 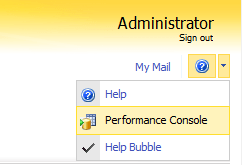 You should see Performance Console now listed. Click it and voila – it should appear. If you want to export the data – simply press the Copy button in the top left corner. The data can then be pasted into Excel. Hope you find this useful, at some point! Great find , What rights do you need to see this feature. Will end users ? I found it by looking around the web.config files for ECP. I started playing around with them trying to enable new-mailbox cmdlets (as they appear to be there in the on-premise version, just disabled) and stumbled across this. Searched around and couldn’t find any mention of it anywhere on the web, which I thought was strange and worth a blog post! Do you know how to get the New Mailbox UI to appear in the ECP ? We use a separate group of people for Mailbox creation and I would rather not give them access to the EMC. It’s in the Web.Config but no combination of changes to the web.config or RBAC makes it work. Apparently it’s not coming back in SP1 either. It’s solely there for Exchange Online and Outlook Live.